The peripheral nervous system is made up of a very large number of nerves, nerve fibers and nerve endings, all of which together provides all parts of our body with sensation and with the ability to move. Any injury, even the most seemingly minor, to one of these nerves or one of its projections will affect the level of sensation and movement ability at a particular area in our bodies, sometimes affecting entire organs or body regions. In some instances, the nerve can recover on its own but in the event of severe damage to a peripheral nerve, microsurgical operations may be required to repair the nerve. Prof. Shimon Rochkind, one of the leading neurosurgeons in the world for the treatment of conditions involving the peripheral nervous system, performs a wide range of procedures for the repair of injuries to the peripheral nervous system here at the Neurosurgical Center for Excellence at the Herzliya Medical Center. For the most part, damage to peripheral nerves occurs due to some kind of external factor including trauma, knife wounds, gunshot wounds, hyperextension, crush injuries or injuries due to prolonged pressure on the nerve. These kinds of injuries can cause partial or complete disruption in the continuity of the nerve, a long, delicate fiber that transmits electrical signals from the brain to the organ innervated by that nerve and vice versa. Level 2: Injury that causes some damage to the nerve fiber, but rapid medical intervention to treat the cause of the injury, can allow for complete recovery with only temporary disability. Level 3: The injury is more severe, causing some level of permanent damage to the nerve. At this level of injury, only partial recovery is possible. Level 4: The damage to the nerve is severe and causes the formation of scar tissue that will disrupt the nerve’s ability to recover. Despite the fact that the damage to the nerve does not always include total severance, surgical intervention is required in order to facilitate healing. Level 5: Complete damage – total severance of the nerve fibers. Requires surgery. Acute neuropathic pain (chronic pain, characterized by a “burning” or “shocking” sensation in the area innervated by the damaged nerve). Motor disturbances (difficulties with movement), sometimes even paralysis. Disturbances to the function of the autonomic nervous system (the system responsible for the involuntary functions of the body, such as continence, blood pressure and more). The type of treatment selected in the event of damage to the peripheral nervous system depends on the severity of the injury. When the damage is minor (usually levels 1-2), the recovery is natural and facilitated by the nervous system itself: thanks to the natural features of the peripheral nervous system, the damaged nerve undergoes re-innervation (regrowth) resulting in improvement in both function and sensation in the injured area. The healing process can be reinforced and stimulated through physical therapy, which can facilitate the process and ensure that it occurs in an optimal manner. That said, there are instances in which the natural healing process and the various treatments available cannot improve the situation. This is especially true in very severe injuries, which prevent the body from healing on its own. Therefore, if no improvement occurs after a certain period of time or if the injury is complete and the distance between the severed ends of the nerves is too great, microsurgical intervention is required. Prof. Rochkind, one of the leading neurosurgeons in the field of peripheral nerve repair, has performed innumerable operations over the years to repair these kinds of injuries. Prof. Rochkind is also involved in research and development of innovative methods and approaches for the optimal healing of damage to peripheral nerves. The operations themselves involve microsurgical techniques and focus mainly on either the release or repair of the damaged nerves, because, for the most part, as mentioned earlier, surgical intervention is required when the injury is particularly severe, to the point of complete severance of the damaged nerve fibers. During the operation, the damaged nerve is released from the scar tissue that has formed around it, thereby stimulating the healing process. The operation includes the use of surgical microscopes and other highly precise microsurgical tools to ensure the most optimal results. Additional procedures that allow for healing of the damaged nerves include the grafting of healthy nerves in the area of the injury and the formation of anastomoses—suturing and connection of the proximal area of the nerve (the area of the nerve closest to the center of the body) to the distal part of the nerve (which is the part further from the center of the body) to enable future transmission of electrical signals through the nerve. Note that in some cases, nerve injury of this type can cause the development of a benign tumor known as a neuroma, which is removed during the operation. The removal is performed using microsurgical tools as well, in an effort to preserve the health and structure of the nerve tissues and the nerve sheath that surrounds the nerve. 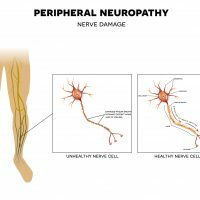 Are you suffering from peripheral nerve damage? Do you constantly suffer from severe, localized pain, weakness or even paralysis? Contact us today at the Neurosurgical center for Excellence at the Herzeliya Medical Center.